You Want Reports? Well, Why Didn't You Say So? We thought this day would come much sooner, but here it is and we are so excited to share Reports with the world! Reports! Reports! Long live, Reports! 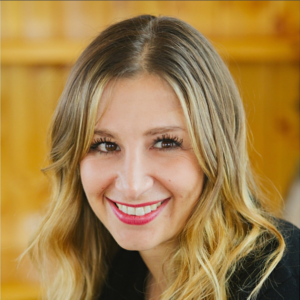 You want to slice and dice your financial data every which way? Check. You want a high-level view of how you’re doing? Done. You want to get down to the nitty gritty details of a particular category? Woot! You want colorful graphs and pie charts? Bam. 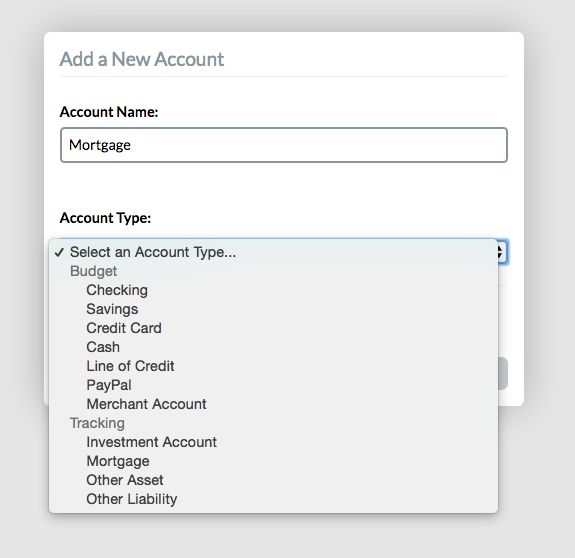 Categories & Timeframes & Accounts, Oh My! The default view shows all of your categories, but if you want to compare specific master categories or even specific subcategories, you can toggle those categories on and off. You can “Select All” to easily go back to the default view of all categories, or you can “Select None” to start with a blank slate and choose the categories you want to evaluate. Using the preset filters at the top of the timeframe dropdown, you can toggle between “This Month,” the “Latest 3 Months,” “This Year,” “Last Year,” or “All Dates.” If those presets are too generic, you can enter custom start and end dates in the “From” and “To” fields, to query a specific timeframe. Most people handle unique accounts differently. Maybe you just want to look at your checking account, or you want to see the growth of an investment account that you’ve been tracking. 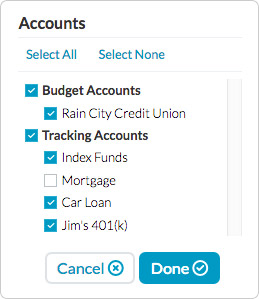 In the accounts selection dropdown, you can toggle individual accounts on and off or select “Budget Accounts” or “Tracking Accounts.” Easily view all accounts by checking “Select All,” or start with a blank slate by checking “Select None,” and then simply check the accounts that you want to see. 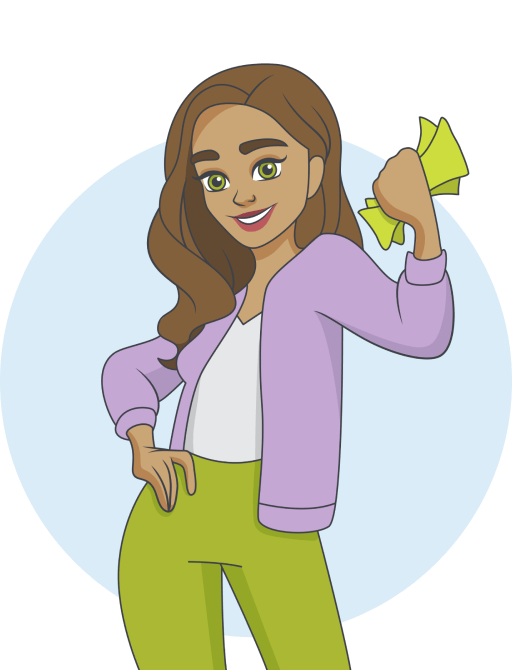 The Spending Report brings all your spending to life! You can view your spending totals in apie chart or your spending trends in a bar graph with a simple trendline that shows the data by month. 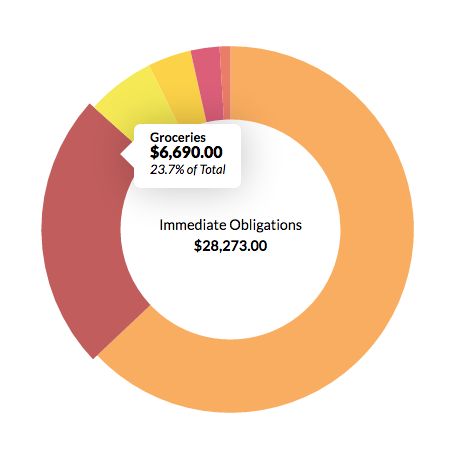 In the Totals section of the Spending Report, you will see a color-coded circle graph showing your spending totals as a percentage of your overall money spent. You can hover over each section of the circle graph to see both the total amount spent for each category along with the percentage of the total amount spent. You can also use the legend on the bottom right to determine which color corresponds to which category. In the blue container on the right-hand side, you’ll see the timeframe, and which categories and accounts you are currently viewing. You will also see your spending totals and averages for the selected categories. The default view will show you all selected master categories. If you click on a category in the circle graph (or in the legend) you can then drill down into the subcategories of that particular master category. The blue container on the right will now show you the totals and average for only that master category. The Trends report is set up in the exact same way as the Totals report. You have your color-coded categories (now in a bar graph) on the left side of the screen and your total, average, and graph legend in the blue container on the right. You can hover over each colored category in the bar graph to see the total and percent of the total spent for each month. 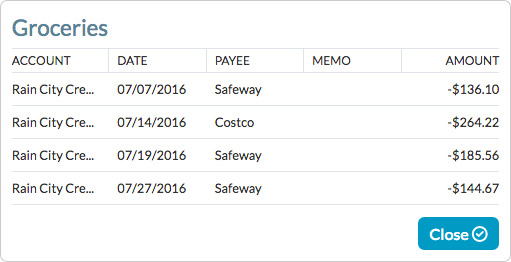 By clicking on a colored category, you will then drill down into that category to see the total spent for each subcategory. 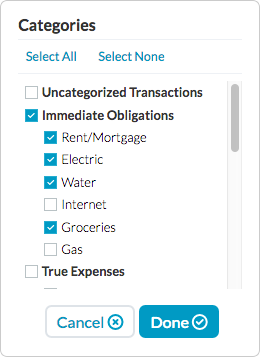 As with the Totals report, you can click on each subcategory (in the bar graph or in the legend on the right) to view all transactions tied to that subcategory. 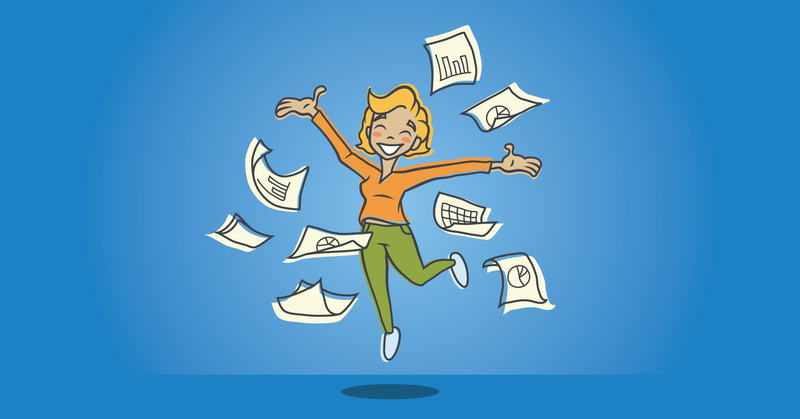 Breaking the paycheck to paycheck cycle is awesome, but building wealth is a close second. The better you budget, the faster your Net Worth graph will climb. Your net worth is determined by subtracting your debt from your assets. This report will hinge a lot on Tracking Accounts for things like mortgages, savings and investment accounts along with your everyday accounts like checking and credit cards. The Net Worth report works rather simply: debts (or negative accounts) are shown in red while assets (or positive accounts) are shown in blue. 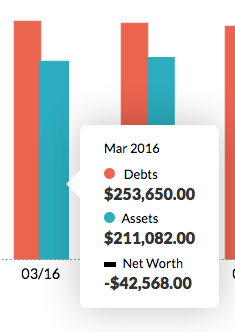 Hover over each bar (both red and blue) to see the breakdown of your debts, assets, and total net worth for each month. In the blue container on the right, you will see the timeframe, accounts, and total change in net worth for the selected timeframe. Additionally, across the bottom, you’ll see is the itemized month over month change. 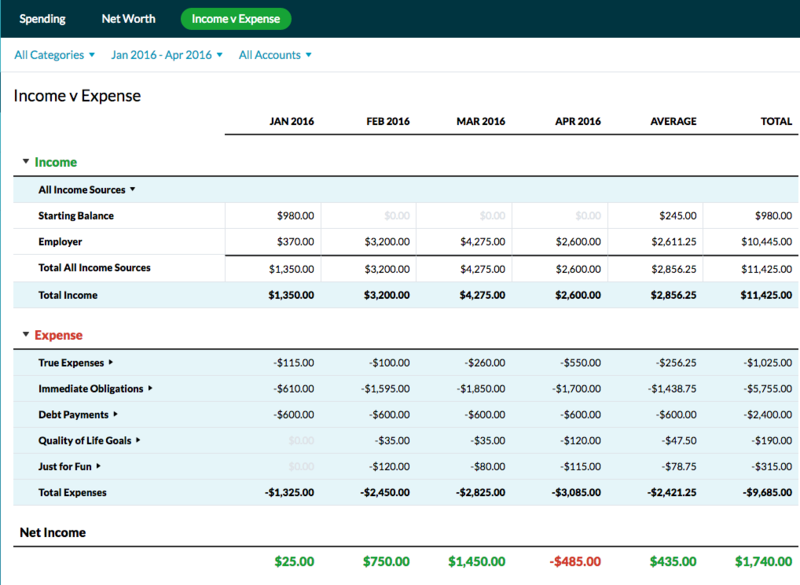 This one is just exactly what it sounds like—your income is shown across the top (under the green “Income” heading) while all of your expenses(read: spending) is shown at the bottom (under the red “Expense” heading). 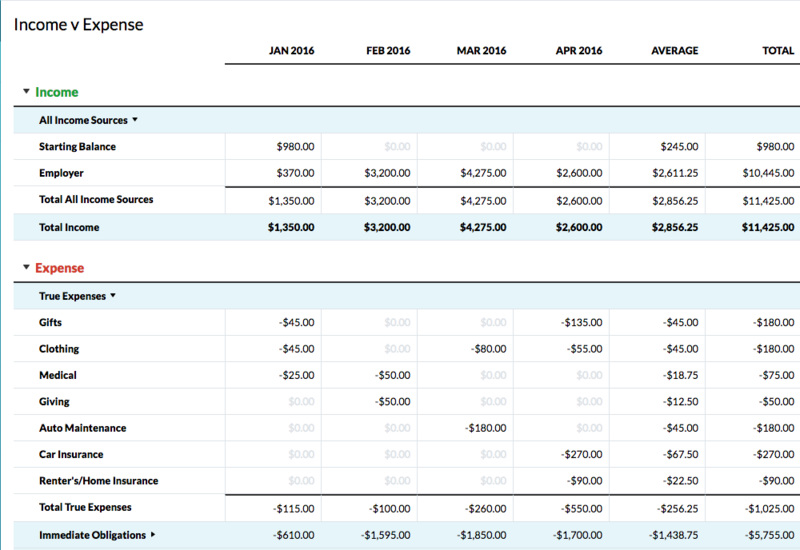 This report maps both your income and expenses month by month along with the averages and totals for each category. If you want to see subcategories, simply click the arrow to the right of each master category (the blue rows) and the subcategories will expand underneath. So, there you have it: all of your income, spending, assets and liabilities in reports that are easy to filter, manipulate and dissect. And pretty to look at and share. We hope we’ve filled the reports-sized hole in your hearts! Ok, we’ve got to get back to work! Lots more to do!